I love a good provisional cast on and use them often, especially when making turned sock cuffs for the ultimate in stretch and flexibility as well as good looks, but also in many other projects where the knitter is required to knit one way and then carry on the knitting in the opposite direction (such as when knitting a lace scarf from the centre outwards, to ensure both halves match perfectly). I use a few different provisional cast-ons when knitting, but two get called upon most often. The first may not be a ‘true’ provisional cast on, but it works as one when I am in a pinch and without any tools. I simply cast on the required number of stitches with waste yarn in a contrasting colour, knit three or four rows and then continue my knitting as usually. When it comes to take the waste yarn out I cut it off a row away from the edge of my ‘real’ stitches and pull the waste yarn carefully away. It isn’t elegant, and it can be messy (with lots of snipped yarn fibres everywhere) but it works when I have forgotten my knitting bag. My Favourite provisional cast-on, however, is the crocheted-on-to-needle cast on. I love this because it is neat, elegant and so easy to remove when needed. Make a simple slip knot. Chain four or five stitches. Place your knitting needle in front of your yarn, to the left of your crochet hook. Bring the crochet hook over your needle to grab the yarn from behind it. Draw this yarn through to create your first provisional stitch. Take your yarn around tot he back of your needle and repeat steps 4 & 5 for as many times as it takes to create all of your provisionally cast on stitches. When all of your stitches have been cast on chain four or five more stitches before breaking yarn. Draw the tail of the yarn through the last stitch to secure. Now all it takes is to simply knit away using your working yarn and you can merrily forget about the provisional cast on until it is time to remove it. Removing this cast on is a piece of cake, and this is where that little knot comes into play. The cast one will only unravel from one end, but which? Well it is (k)not the one with the not in! OK, it’s just a little fun mnemonic of sorts, but it’s saved me a lot of headaches in the past. Free up the yarn tail that you threaded through the last stitch when securing it and gently pull on that end (remember, it is the one without the knot in it). The chain stitches should unravel one by one until you reach your piece of knitting. Slowly pull the yarn tail to free up the first live stitch and slip this to a knitting needle. Repeat this, taking it slowly until all of your stitches are safe and secure. Now, those few stitches cast on in the pictures above are actually the beginning of a new project of mine, so hopefully I will have a new WIP to share in a day or two. I use this same technique for non-provisional cast-ons, too. No need to start with a chain; just put the slip-knot (of the working yarn) right onto the needle, and work from there; don’t count the slip-knot as a stitch, but do count the last loop on the hook as a stitch, and transfer it to the needle. The cast-on edge is sturdy, and looks almost exactly like a standard knitted bind-off! This is also my preferred provisional cast on and I was something I was introduced to when out in the US. I’ve never seen it in a book or anywhere written before so found this very interesting, thanks. I love this cast on, it’s my preferred one for everything! To work out which end is the end to undo, just remember it looks exactly like a bind/cast off, so look at which way the loops are going. (or tie a single knot in the end that isn’t the right end!). Bookmarking this post – excellent tutorial. Thanks! This sounds great! I’m never really happy with the provisional cast on that I normally use. I’ve used a crochet provisional cast on before but can never remember how to do it but you’ve made it look so straight forward! I can never remember how the yarn wraps around the needle (I tangle myself) so I use the other crochet provisional cast on. Crochet a loose chain, pick up and knit into the back bump of the chain. It unzips nicely, too. I’m not a great fan of knitting into a pre-crocheted chain as I find it slightly fiddly, plus I like the rhythm of crocheting directly around the needle, but in essence the two cast Ons ate the same and unravel equally as niftily. This just happens to be my own preferred method. Thank you! I’ve been trying to master that crochet cast-on, or actually the knitting into a crochet chain, but have until now failed. I’ll try this method the next time! 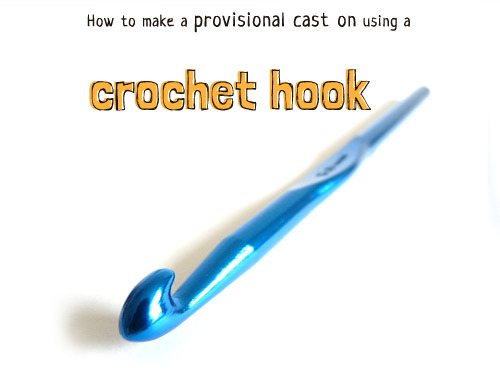 Every attempt I’ve made at a provisional cast-on has ended with me flinging a crochet hook across the room. But here, I can actually see what I am supposed to be doing, THANK YOU. I think things will go more smoothly the next time. I have to say, I’m just too lazy to provisionally cast on using the crochet cast on. I usually do the invisible cast on onto a spare (Knitpicks) cable, and then it’s super easy to knit in the other direction – only thing is to watch out for twisted stitches. But I really like your version, too – it’s always good to learn new techniques! LOVE this tutorial!! Thank you for such clear and easy directions! LOVE this tutorial. Combined with Lucy Neatby’s video I may actually remember it. Lucy’s video is very clear but I can never remember the positioning of the needles. Your unique and large needles give me a strong visual Mnemonic and I think it will stay with me so that I don’t have to keep looking it up. Ditto with the zipping out end. Thanks!